These are straight quotes from the teachers who participated in the survey. Thanks to all of those wonderful teachers for sharing their insights and to Sam for getting it started and putting it all together for us all! The one thing that I know I would have to do, to implement any of these ideas, is to BE CONSISTENT with it and DO NOT GIVE UP OR CHANGE IT. The thing that works is that students have answers for the problems assigned and are required to do the homework, check the homework and come to class already knowing what they don’t understand. The burden is on them to figure out what they need help with. I do check to make sure they have done and checked each assignment, but it is not a culture of me correcting homework to give credit for correct answers. They get credit for doing the HW and checking it. I never called it “homework”, I called it “Assignments” and this year I will call it “Practice”. That better describes the purpose and intent of the assignment. I will also require a writing element to every Practice I put on the board just to reinforce the idea of thinking instead of just doing. Have students create an “exit card” with one problem each day that demonstrates whether they have mastered a specific kind of problem or concept. Suggestion: the “exit card” I mentioned above will be graded. However, if the student does not demonstrate mastery, then I will have them show me their homework and make suggestions for the kinds of problems they need to focus on with their tutor. Neither grade it nor collect it, but give roughly-weekly quizzes that come verbatim from the assigned list. I include the exercise number on the quiz problem to assure students that the HW had been assigned. There are 12 of these quizzes @ 20 points each; I count the maximum score as being 220, so students can miss up to 20 points on these quizzes before having any negative effect on their grade. 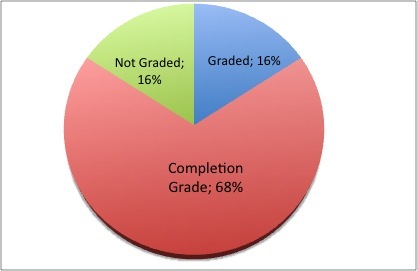 An average score of 18 is therefore a “perfect” score, allowing students to make some limited mistakes. (These are formative assessments, and I explain to students what that means.) Students who score above 18 on average end up with extra credit. Quizzes count for about 20% of the grade total. At the beginning of each unit/chapter I hand out a list of assignments from the text (I use Geometry by Lang/Murrow). I label them “Recommended” and “Suggested.” The recommended problems are the ones I tell the students are the minimum they should be able to do if they understand the topic, the suggested are if they want extra practice. I do not “require” any problems. 1. “What did you learn?” They can refer to whatever occurred in class the day before that resonated or something that they finally understood while reviewing their notes or doing problems. 2. “What specific question(s) do you still have?” They must make the questions specific and not of the “How do you do #13?” variety. If they say they can’t think of a question, I tell them to come up with a “What if…?” type question. Asking questions is a huge part of what I teach. 3. “What specific problem did you have?” This is reserved for the nights when their are problems involved (I also give assignments with just reading or other activities.). Here is where they can identify the one problem that they just could not get. They have to write out the problem as well as any work they were able to do on it. The rule at our school is that regular classes (at the high school level) cannot have more than 45 minutes of homework and honors level 1 hour. I tell them to stop whatever they are doing (reading, problems, etc.) to allow themselves time to answer the 3 questions in the allotted time. Most spend less, some work beyond because they choose to. I give a short quiz at the beginning of class in which the problems come directly from the homework – students are allowed to use their homework on the quiz. This entry was posted in Homework by I Speak Math. Bookmark the permalink. 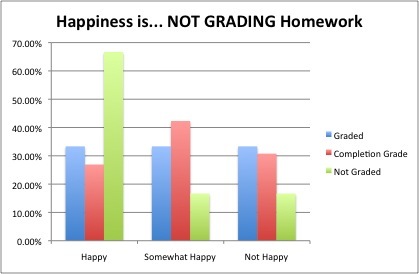 We are having an on going conversation about homework at our school right now (especially in the Middle School) — for my 7th graders, according to the Duke Study, an acceptable amount would be 70minutes of homework TOTAL (all classes combined). But, how do the students find a balance with multiple periods? Do you speak with your grade level team to discuss how you will all work together to keep the load at 70minutes? Do you account for students who work at a slower pace?